Place the quinoa and water in a large saucepan over high heat. Bring to the boil. Reduce heat to low, cover and cook for 15 minutes or until the quinoa is cooked and water has absorbed. Set aside to cool slightly. Place the vinegar, mirin, and salt in a bowl and stir to combine. Pour the mixture over the quinoa, mix to combine and set aside. Brush the tofu with the chilli jam. Heat the oil in a large frying pan over medium heat. Add the tofu and cook for 1–2 minutes each side or until crisp. Cut into strips and set aside. Place a sheet of nori on a sushi mat and spread evenly with 2⁄3 cup of the cooked quinoa, leaving a 3cm border at the top of the sheet and pressing down with damp hands. Top each sheet with a slice of the tofu, avocado, baby cucumber, radish and pickled ginger. Brush the clean edge of the nori with water, roll tightly to enclose and slice into rounds. Repeat with remaining ingredients. 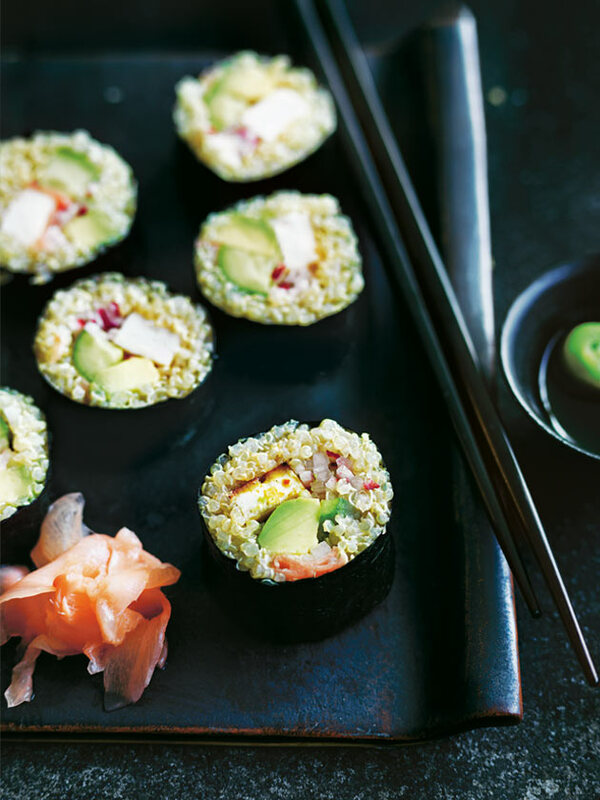 Serve with extra pickled ginger, wasabi and soy sauce. Serves 2.